For those of you craving news of iPhone 4 prices and tariffs, we’ve got your back. This post will feature up to date details of all the major networks prices as they become available. So far only Orange has officially made theirs available. Vodafone prematurely released their prices two days ago, we can assume they are correct but will have to wait for confirmation. 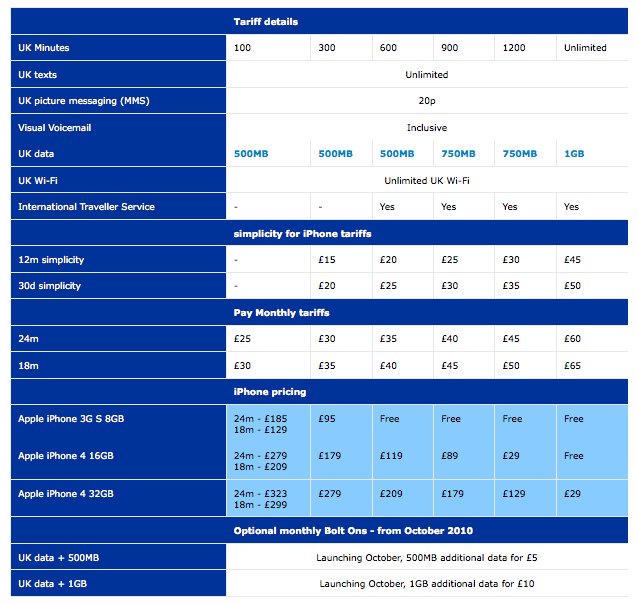 o2 released its pricing on 17 June, click here for full size image or visit the o2 website. On 18 June the company announced that until at least the end of July they will only sell the iPhone 4 to existing customers. Pretty steep. 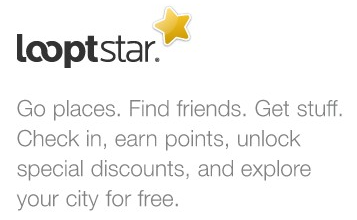 There’s no way to get the iPhone 4.0 for free. 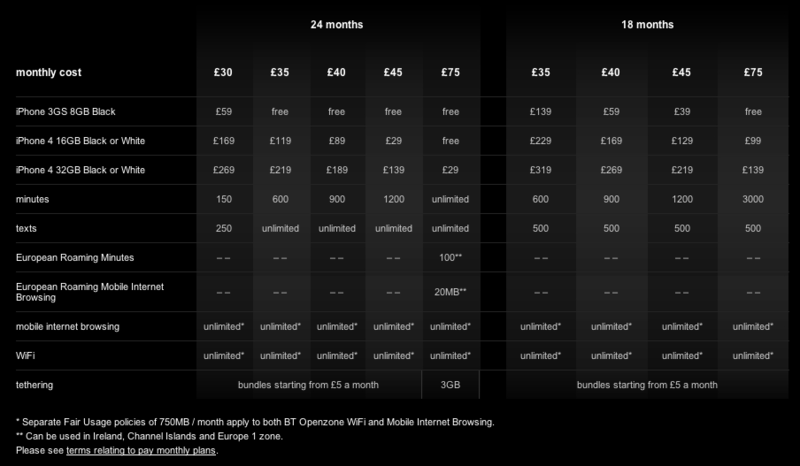 The cheapest option is £29 for a 24 month contract paying £75 a month. Data is stated as unlimited though but there is is a 750mb “fair use” policy. Click image for full size or visit the Orange site here. Vodafone pricing was first out the gate in the UK, although these prices turned out to be a leak of unfinalised prices. The reality is a little more expensive than the leak suggested. These are the prices that were released by Vodafone on Friday 18 June. 16GB iPhone 4 on a 2 year contract. For 18 months, add £5 per month to each tariff. 32GB iPhone 4 on a 2 year contract. For 18 months, add £5 per month to each tariff. Vodafone will also offer a pay-as-you-go deal, but pricing is yet to be announced. 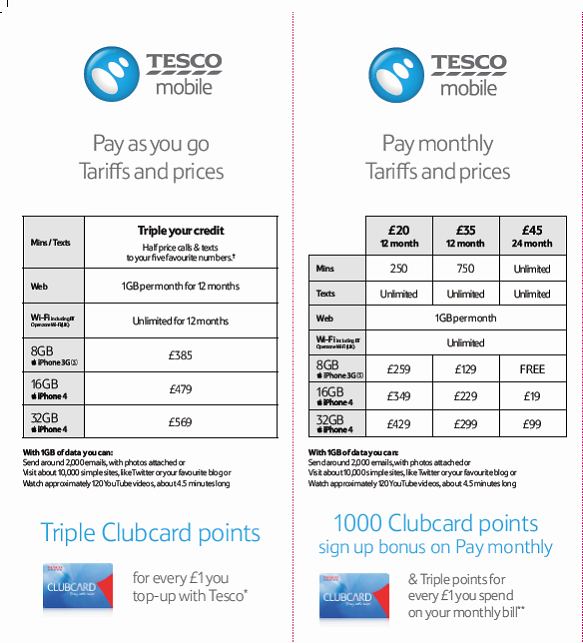 Tesco released (H/T Techradar) its pricing plans on the 23rd June, giving customers the chance to enjoy shorter contracts than most of the other main mobile operators. On PAYG, the 16GB iPhone 4 will cost £479, with the 32GB iPhone 4 setting you back £569. If you want a 12-month contract, £20 per month will include 250 minutes of talk time, 1GB cap on data and unlimited text messages. On this contract, the 16GB iPhone 4 is £349 and the 32GB will cost £429. Tesco’s other 12-month contract costing £35 a month includes 750 minutes of talk time with the same data and text allowance as the cheaper plan. The handset will cost you £229 for the 16GB model and £299 for the 32GB model. For those wanting to get their hands on the iPhone 4 without a large upfront cost, Tesco offer a 24 month plan offering unlimited calls, texts and data for £45 pounds a month. On this plan, the 16GB iPhone 4 costs £19 and the 32GB model is £99. According to Three the SIM-only plans will be available on the 25th June and there are no details on when the iPhone 4 will go on sale at Three. For more information, visit Three’s website.